Residents of Newtown have promised to honor the lives of the 20 children and six adults killed at Sandy Hook Elementary School a month ago and are asking people across the country to join them and become part of a national effort to bring about change so a tragedy like this never again happens. 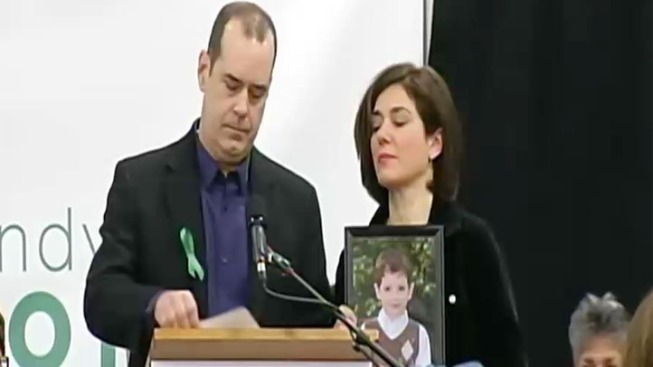 Parents of several victims not only attended the news conference announcing Sandy Hook Promise on Monday morning, but also held photos of their children and spoke. Nicole Hockley, the mother of Dylan Hockley, said she does not want to be someone who shares her experience and consoles another victim's family because she does not want there to be another shooting like the one that took her 6-year-old son. She said it will take a nation of communities to achieve true transformation. 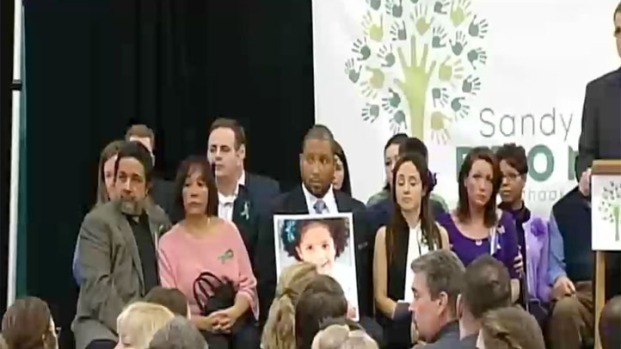 The families of Dylan Hockley and Ana Marquez-Greene are joining members of their community for Sandy Hook Promise, to honor the victims of the Newtown school shooting and to bring about change. “I am … proud to stand for my son Dylan and pledge my enduring support to this promise,” she said. “This is a promise to turn the conversations into action. Each child, every human life is filled with promise." Nelba Marquez-Greene held a photo of her 6-year-old daughter Ana as she said she put two children on the school bus on the Friday morning of Dec. 14, but only one came home. Faith is helping the family get through tragedy, she said, and they are choosing love as a way to honor their young daughter. "Love wins. Love wins in Newtown. May love win in America," she said, adding that the promise residents of Newtown are making is in support of families, neighbors and honor those whose lives were lost. There is no agenda other than to keep communities safe. The non-profit organization, formerly called Newtown United, is focused on supporting the victims’ families, the survivors, first responders and teachers and staff of Sandy Hook and the town of Newtown, according to the Web site. They plan to do this by providing support, both financial and service. Tom Bittman, a cofounder of Sandy Hook Promise, said this grassroots campaign is not just about the families, but about Newtown's community, schools and being remembered for bringing about change. "We will work for real solutions to make every community safer," he said. "Doing nothing is no longer an option." Jeremy Richman Jennifer Hensel, parents of Avielle Richman, thanked the local, national and worldwide communities for “unwavering support” in a dark time. What happened to their daughter could happen in any community and they feel it is their responsibility to be outraged and take action, Jeremy said. “There’s not going to be one simple solution,” Jeremy said. He said they have started the Avielle Foundation to conduct research on mental health issues, both behavioral and biomchemical. identify risk factors and measure successes in help and intervention. “With this foundation, it is our hope to honor our beautiful Avielle and all the others that have fallen to such senseless violence,” Jeremy said, fighting back tears. David Wheeler and Francine Lotus-Wheeler, parents of Benjamin, also gave thanks for all the support. “We are parents -- just two of 149 million American parents,” David said, adding that parent is defined as a point of origin and reflected on the important role of parenting. “My wife and I have spent most of the past month to the task of being the best possible parents for our surviving son, Nate. What we have recently come to realize is that we are not done being the best possible parents we can be for Ben, not be a very long measure,” he said, and asked that all parents pause and asks themselves what is it worth doing to keep children safe. “What is worth doing?” he asked. The residents also said they are committed to preventing similar tragedies from ever happening again and are asking people from across the country to "make a promise to encourage and support common sense solutions that make their communities and our country safer from acts of violence like that which occurred at Sandy Hook Elementary School on December 14, 2012." Tim Makris, cofounder of Sandy Hook Promise, said everyone in the nation can learn by the way the community came together after the tragedy. “The goals of Sandy Hook Promise are within our reach. Now, it is time to get to work,” he said and asked people to make the promise. He said the organization is looking for a national discussion, to put aside preconceived notions and to doing something different to solve the problem.